Verizon has the most dishonest coverage maps in the industry. They cater to simple minded people. Verizon doesn’t distinguish its weak areas vs strong areas. They just paint it all red so the slow folks and uninformed sheepish customer will think coverage is great everywhere. Congrats Verizon. You just fooled another internet journalist! 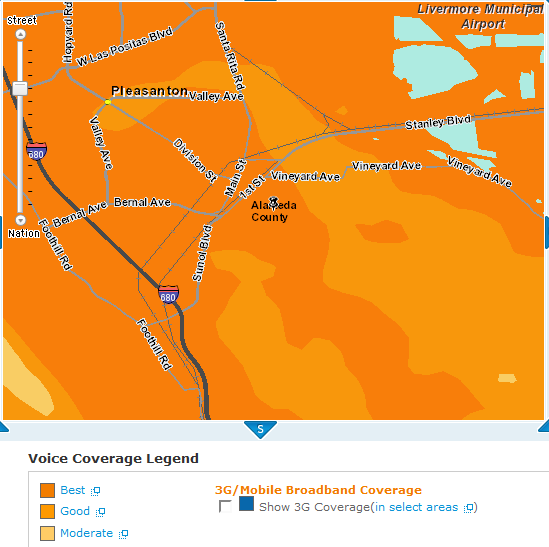 After seeing the above two comments, I checked Pleasanton’s Sprint coverage map, and it seems that the majority of Pleasanton is in the “Best” coverage, so, the definition of “Good” will be less of an issue. Additionally, Sprint now allows people to test their service for 30 days. If you go home or drive around town having reception problems, Sprint will give you all your money back, and cancel your service without an early termination fee. So instead of having to reply on industry definitions of “Good”, (which are clearly stated as you show), you can see if “Good” provides you with the service you require for a month without penalty. I can’t speak with respect to AT&T or the IPhone 4G, but at least this seems to give a reason for trying out the upcoming HTC EVO 4G from Sprint. (not to mention that Sprint gives a $100 credit for porting a number to Sprint, and while Verizon has the least dropped calls, Sprint had the second least among the big 4) What will you lose, a chance to try out the hottest upcoming smartphone, and service prices MUCH cheaper than Verizon? I do agree with the poster, if one has no service, IPhone, Android, or Windows 7 makes no difference. But at the end of the day, it looks like Sprint is giving plenty of reason to find out, if “no reception” is actually a problem at all. From this person who carried a Verizon and Cricket phone… I think I’m going to give Sprint a chance to save me some money, wow me with what they “promise” from their 4G network and the HTC EVO. June can’t get here soon enough. I’ve tried AT&T (then Cingular), T-Mobile and Sprint in this area, they all had very poor signals, true to their coverage map. Verizon phones side-by-side. (Except for the Droid–It’s usually about the same as that.) This is a pretty well-known issue for the Incredible. Again, it hasn’t dropped any calls for me, but coverage has never been an issue where I live. It could be a problem of you’re on the line. Yes, it has very low signal – and of course now I don’t know how much of it can be attributed to the phone itself, vs. Verizon’s coverage. The Incredible has a strange antenna placement: it’s at the bottom, and depending on how you hold it in your hands, you can experience 10-15 dBm differences in signal levels. Mine is pretty week in the house, and not just the cellular part: it even drops wi-fi a room away where laptops can happily connect. Verizon may have good signal where you are, but again the map doesn’t differentiate between good or bad. Verizon advertises their maps as all red for a reason Even in areas where the signal is so weak you can’t place a call…. It’s for marketing purposes. Inbuilding coverage is never going to be perfect from any wireless network. That’s why so many networks are now releasing femtocells, which help solve that issue. A better option (that doesn’t lock you into using just one carrier) is a cell phone repeater, which is basically just a cellular signal amplifier. Websites like http://www.repeaterstore.com offer lots of different models, and if you’re stuck in an area with poor signal, they can be a very useful solution. Now, it’s 2010 and I still have Vonage (and the number in the Florida Keys) and the faceplate is still blank. But, I have abandoned AT&T after 17 years to switch to Verizon’s service so I could get a Motorola Droid. I’m no fan of Verizon or any of the carriers, but I’m happy for now. Now that you mention it, I have noticed the signal strength varying depending on how I hold the phone. It’s weird, but doesn’t seem to fluctuate enough to affect call quality. In fact, the more I look into it, the more I think call quality isn’t an issue at all, no matter what the signal strength appears to be. I’ve been comparing the Incredible side-by-side to other Verizon phones every chance i get and it is almost always the same measured in actual dBm. Signal bars, of course, are all over the place. So far I’ve compared it to Droids, Blackberry Tours, Erises, and one or two others that will display signal in actual numbers. It’s almost always within 1 or 2 compared to all of them (it was acutally better than the Blackberry phones). The only significant difference was compared to an Eris at my apartment. For some reason, the Eris had a much better signal while sitting right next to my Incredible, but only at the apartment. Bottom line, calls sound fine and the phone has yet to drop one. Whether it’s an actual signal problem or just that the bars aren’t calibrated very well I do not know. It’s possible that the Incredible makes up for poor reception by giving more power to the radio receiver (which would explain some battery issues), but that’s probably best left for another discussion.